Recently the Long Island Chapter of A.S.M.P. (American Society of Media Photographers) in conjunction with the A.S.M.P. Foundation held its 2nd Annual Photographer’s Fashion Workshop at Brenner Photo Productions in Plainview, New York. 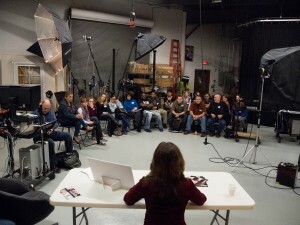 The all-day workshop was hosted by Jay Brenner and his studio staff and was very well attended by 30 -40 photography students, ASMP Members and photographers from Long Island, New York and Connecticut. The workshop featured a panel discussion with photographers Jay Brenner of Brenner Productions; Harold Naideau (President of A.S.M.P. Long Island); and Allison Cresswell, President of Hampton Models and staff members from both the modeling agency and the studio. The panel discussion included an explanation of the relationships necessary between photographers, models and agencies. Janice Catanzarita, makeup-artist and hairstylist, discussed the necessity of professional makeup and styling involved in any professional fashion or beauty shoot.The participants then had the opportunity to photograph the five models from Hampton Models (Alex, Michael, Angelina, Casey, Michele) on two separate sets. One set was high-key, being a white plexi-glass platform against a white background and the 2nd set was black seamless with side lighting. Thanks to the studio’s staff the students were able to set their ISO’s, shutter speeds, f-stops and clip-on the Pocket Wizards and shoot – knowing they would be getting perfect exposures. What they had to learn was how to shoot models, how to talk to them and relate to them on the set, and how to become directors. All of the models were chosen because they were not only professional and experienced, but because they were friendly and down-to-earth and not intimidating (as the students all expected them to be). In the end the results were very encouraging and most participants were very happy with their images and what they had learned. The workshop was conceived and designed to help students and photographers alike understand the studio environment and how we all have to work as part of a team. Our focus and goal at A.S.M.P. is to create events such as this that foster communication and the sharing of knowledge and ideas amongst photographers. It is refreshing to participate in something like this where there is no ‘competition’ involved. A.S.M.P. Long Island is truly appreciative of the support we have received from the A.S.M.P. Foundation who funded this event. And A.S.M. P. Long Island is very appreciative and proud to have partnered with Brenner Photo Productions in making this event possible. Previous post Our Own Nicole Amesti was on TV!